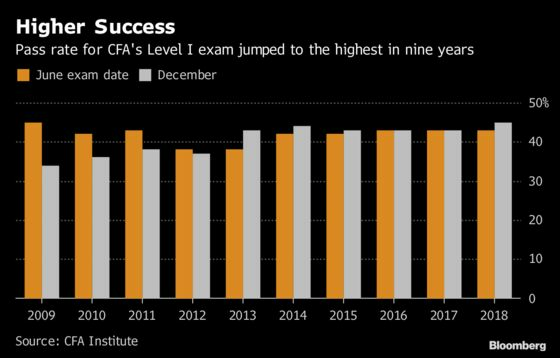 (Bloomberg) -- Forty-five percent of test-takers passed the first level of the Chartered Financial Analyst exam last month, the highest rate since 2009. A record 34,651 candidates passed the test, the first of three needed to earn the designation, according to results published Wednesday by the Charlottesville, Virginia-based CFA Institute. The Level I exam is given in both June and December. In 2018, 156,752 candidates took the first-level test, a 19 percent annual increase driven by growth in the Asia Pacific region. More than 23,000 people sat for December’s exam in mainland China, nearly double the U.S. total. Finance workers aspire to the CFA designation to improve job prospects, earn higher salaries and better understand their industry. The Level I exam is the initial hurdle in a process that takes an average of four years. Fewer than one in five who begin the process successfully earns a CFA charter.